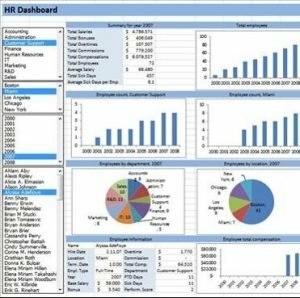 HR Dashboards have been a key tool for HR professionals across various departments for a few years now. I remember working on my first one in 2008-ish, and it looked like this. Not exactly pretty – but at the time, it did the job. It summarized all of the “important” HR data into one document to be shared with the C-suite. Only to be ignored by each leader, and frankly, never being looked at or discussed after the 10 minute presentation in the boardroom (if we were lucky to fit it in each month). Dashboards can have significant value for HR, like they do for other departments, but HR is doing dashboards “wrong” for the most part. 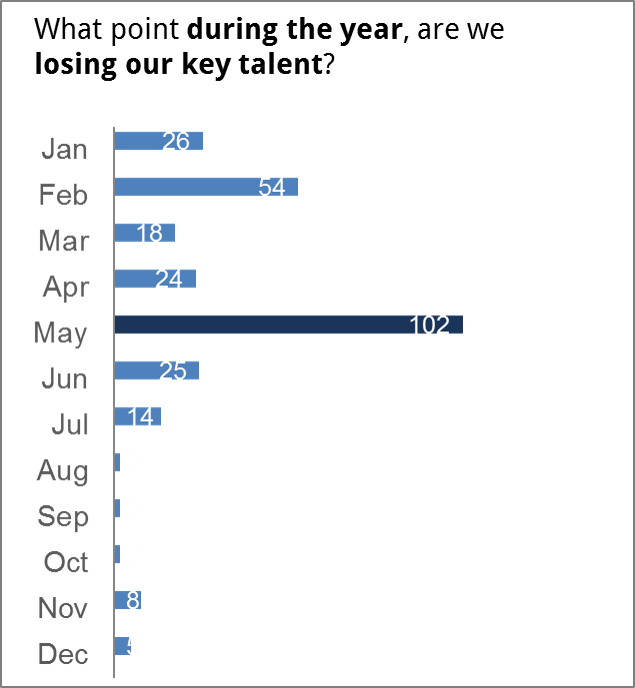 It’s not our fault, but it does provide us with an opportunity to create more meaningful visualizations going forward. Most of us are familiar with dashboards that mimic our favorite HR tools, reports or something we’ve “always” used in the past. Does this look familiar? While at first glance it may seem impressive – colors, circle charts, lots and lots of data, at the end of the day, this dashboard holds exactly zero value to US and more importantly, to the leaders we want to share them with. The whole point of your HR Dashboard is to highlight/showcase how HR is supporting the business’ goals – what you’re doing each day to drive results to the bottom line. That’s very different than presenting all of the information HR is doing… regardless of the impact. 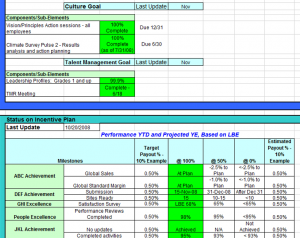 Most HR people that I know, just like me, want to share as much information as possible when we create our HR Dashboard. I don’t know if it’s because we feel we need to justify our budgets, or we want everyone to know how hard we’re working. Regardless of the reason behind it, including all of your HR data is the worst thing you can do for your dashboard. Only use data that is relevant to the COMPANY – and more importantly, their bottom line. For example, most HR departments track retention rate at this point. But including it in your dashboard should NOT be a given. Let’s say your company is a start-up and wants to create an environment of innovation and diversity, meaning they want fresh ideas and employees to support that mission. Retention rate of the employee population would have zero value at that company – it’s not a behavior they’re trying to drive. And if HR is providing this metric on their executive dashboard, you have instantly lost credibility and will be seen as not “being in touch” with the company mission. Every single item that you include in your HR dashboard needs to connect with the company’s goals, vision, values, etc. It’s up to you to create the connection from the company’s drivers to what you, in HR, do on a daily basis to support that – then insert that specific metric. The funny thing about dashboards, heck even metrics alone, is that every single person will interpret the information differently based on their own life experiences, comfort level, math skills, biases, and so on. You get the point. Even if you think the information is crystal clear because you are showing the math – it’s not going to be “heard” in the same way by your audience. Using the same example from above, retention rates – a 75% retention rate may be read as exceptional to the Marketing leader and dismal to the R&D leader. In other words, just showing the numbers is going to get your dashboard ignored… or worse, misinterpreted. When you create your dashboard, be sure to point out the exact story you’re trying to share. See how much more impactful this is than simply putting all of the numbers there for people to figure out on their own? Your HR Dashboard, if done correctly, will quickly become a very influential and impactful tool for your senior leaders. They’re going to be looking forward to the next one, asking questions about HR’s work, and so on. Don’t be tempted to stuff EVERYTHING into this one tool. When you’re designing your dashboard, after reviewing the must-have elements and the storytelling highlights, consider your audience’s attention span and “good design” (white space, font-size that’s easy to read, and so on). Treat your dashboard like a treasured document. Only include the gold stars; ensure your audience has the absolute best experience interacting with it; and finally, be ruthless with the editing pen. If you have so-much-to-say and can’t seem to fit it all into a shorter document/report/dashboard, invite those who are interested to follow-up – and share the raw data or an extended document with those people. Make it an option to opt-in for more details, but don’t make your audience work for the golden nuggets. Treasure the space – and your audience will thank you… and more importantly, pay attention to you each month when you deliver the dashboard.